What this means for you is that from the beginning we will always be there to keep a mindful eye on your overall project and budget concerns. You will never feel left alone to find information or figure out what needs to be done next. We will be your point-of-contact from the time you first envision your building up through obtaining the final CO and closeout. 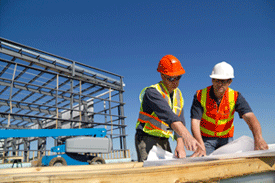 There isn’t a faster, easier or more economical way to approach a building project. We will make all the pieces fit. From obtaining site plan approval and building permits up through the final Certificate of Occupancy, our Design Build job will not be complete until your building vision is standing there, a reality, ready to be occupied. Perhaps you already have your plans and specifications. It is not too late to work with us to erect a pre-engineered metal structure. We often partner with owners, architects and engineers to evaluate options and provide a fresh approach. Pre-engineered steel structures can be a great alternative. They offer a tremendous economic savings over traditional construction. And each building is designed specifically to the needs and vision of each client. So your construction vision does not need to conform to our buildings. Rather, our buildings are expertly designed to fit your precise needs. This option is particularly favorable when builders are seeking an effective economical solution to a project budget crunch which can be a project maker or breaker when it comes to handling budget constraints.